I hope you are all well and getting ready for the holiday season. I have been approached by numerous families of kids with special needs with concerns about using texting as a means of communication during the holidays, especially for communicating with family and friends who they may not get to see in-person. In response, I have created a fact sheet for parents and other caregivers to use as a guide for helping their child master this skill appropriately and safely. 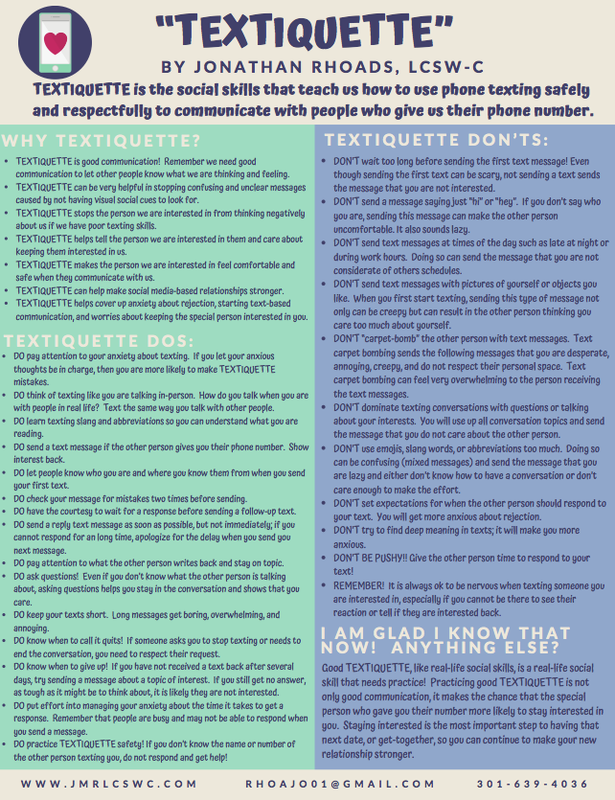 Please remember that texting etiquette is a set of social skills just the same as "in-real-life" social skills and is much more useful when practiced regularly. I hope you find this helpful and happy Thanksgiving! Please feel free to use this resource as you wish, however note that it is protected under copyright and trademark laws. Please feel free to get in touch with me if you have any questions about using this resource in other capacities besides those for which it is intended. Thank you! I found your printables. They are AMAZING!